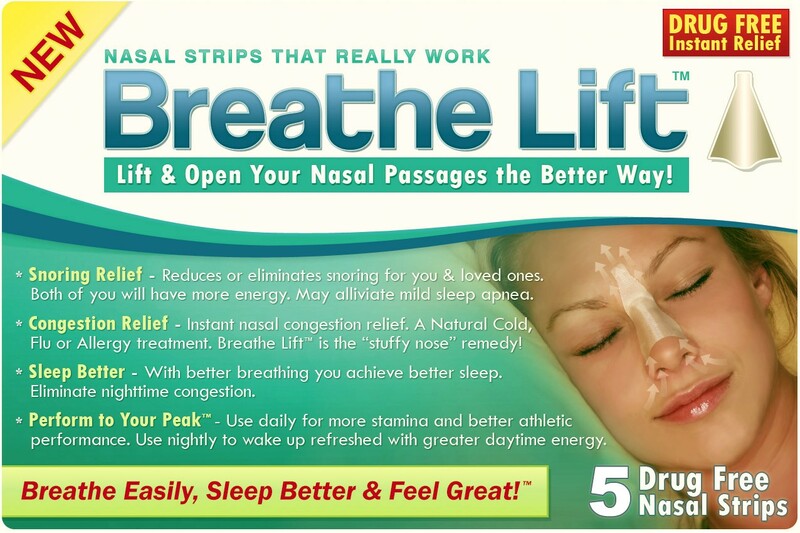 Breathe Lift - Open your nasal passages with this nasal strips and forget about nasal congestion, stuffy nose, snoring or any other breathing problem. 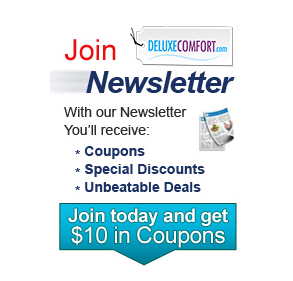 Snoring Relief Reduces or Eliminates snoring for you & loved ones. Will alleviate mild sleep apnea. Congestion Relief Instant nasal congestion relief - Natural Cold, Flu, Allergies treatment Breathe Lift - the 'stuffy nose' remedy. Sleep Better Better breathing, you will obtain better sleep. Enjoy Eliminating nighttime congestion. Exercise Better and Perform to Your Peak Gain more energy right away or obtain vigor in your next day from sleeping with Breathe Lift at night. Maintain Nasal Passages open and Breathe with no discomfort, Sleep Better & Feel Great! People whose sleep is regularly interrupted by snoring or congestion, the impact can be huge. Improved breathing helps your well being, and those around you, because now you can sleep the entire night without interruptions. Breathe Lift will stimulate to draw the water out of congested tissue, reduce the edema or swelling and open up the nasal airways and sinus openings to stimulate for better drainage. Breathe Lift is used to effectively lessen the symptoms of common illnesses such as cold and flu, and to bring allergy & congestion relief. Helps dry congestion related to acute and chronic nasal stuffiness due to colds, occupational, environmental and home allergens. Breathe Lift helps with watery eyes, and a runny, stuffy, or itchy nose. Do your everyday activities at your 100%! Running, biking, rowing or working out, every athlete strives for peak performance.If you use Breath Lift daily, you will gain more stamina and improve athletic performance. Put it on every night to wake up totally refreshed with greater daytime energy. 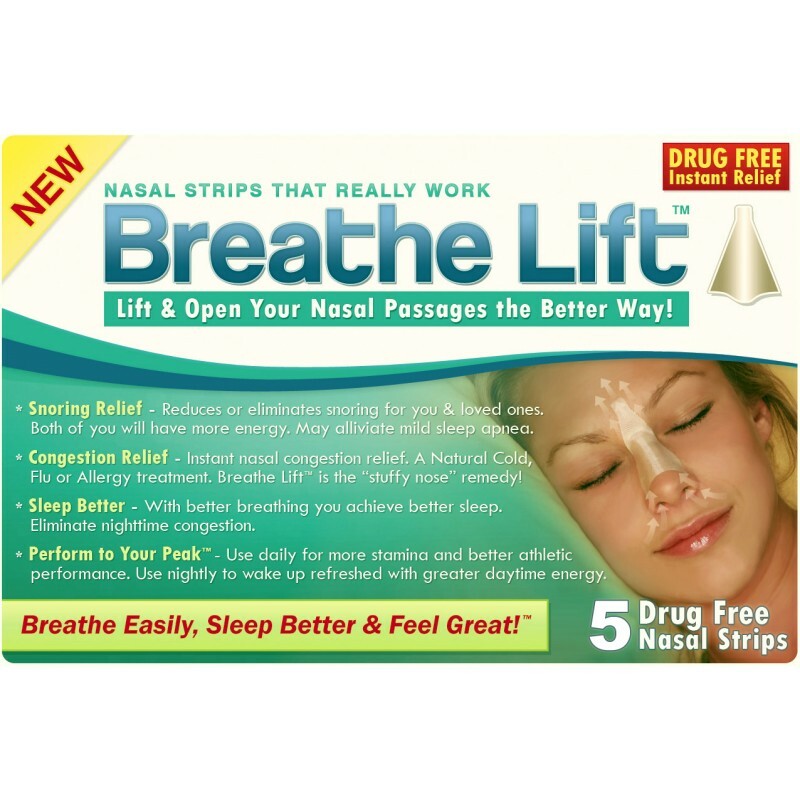 If you tend to breathe through your mouth when exercising, put on a Breathe Lift nasal strip. When exercising, breathing through your nose is more energy efficient. More air equals more energy. The less work you put into breathing, the more effort that goes into your workout. Snoring - For best results just use nightly. Relieve Nasal Congestion - due to Allergies, Colds or Deviated Septum. 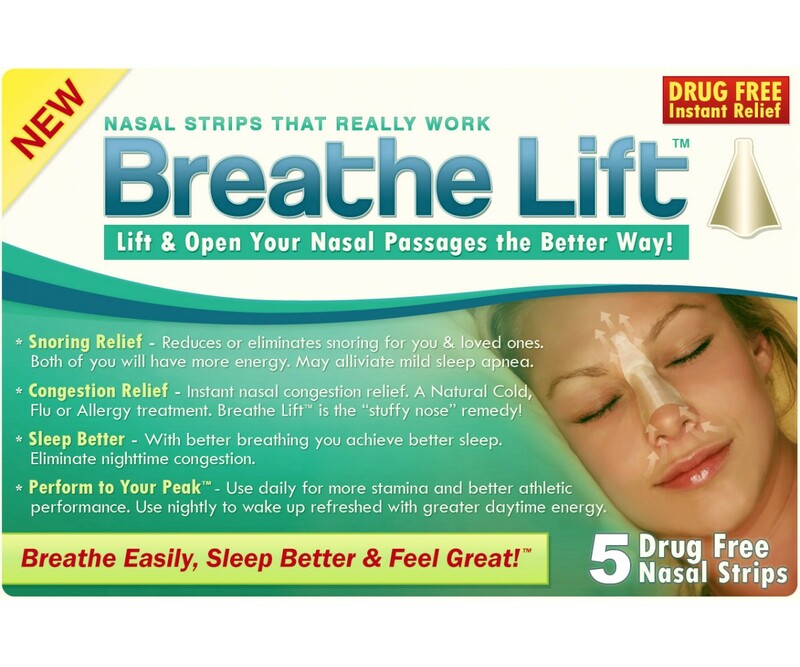 Breathe Lift nasal strips offer temporary relief from nasal congestion and stuffiness and may also lessen or eliminate snoring. Use while resting, practicing sports, or during the day. This product is safe during pregnancy and is non-addicting or habit forming. Caution: For external use only. Do not use over sores, sunburned or irritated skin. Disposable, use each nasal strip only one time. Do not use for more than 12 hours per day. If rash or skin irritation takes place, do not continue using it. This nasal strips are not to be used in children under 5 years . Packaging of this product contains natural rubber latex that may produce allergic reactions. Directions: Breathe Lift treatment is very easy to use, latex free and very comfy to use. Apply it 30 minutes prior to a workout to enhance adhesion when perspiring. If the strip loosens due to perspiration, use an astringent or rubbing alcohol to clean the surface of your nose before the next application. To use it, first CLEAN the area, APPLY, LIFT, FASTEN & BREATHE BETTER. Please read enclosed instructions before use. Breathe Lift was the only product that worked for me and I have tried a whole bunch of them. My fiancé is extremely happy now that my snoring has considerably subsided. And now I feel like I have more energy and I sleep so much better. Thank you Blaise and Nareman, the creators of Breathe Lift for making me and my fiancé’s nightly sleep better than ever. I’m not very thrilled with these. I hate how my skin gets all pulled out in the morning, though my husband has said that it’s been working for me but I don’t really think it does. I will never purchase these again.